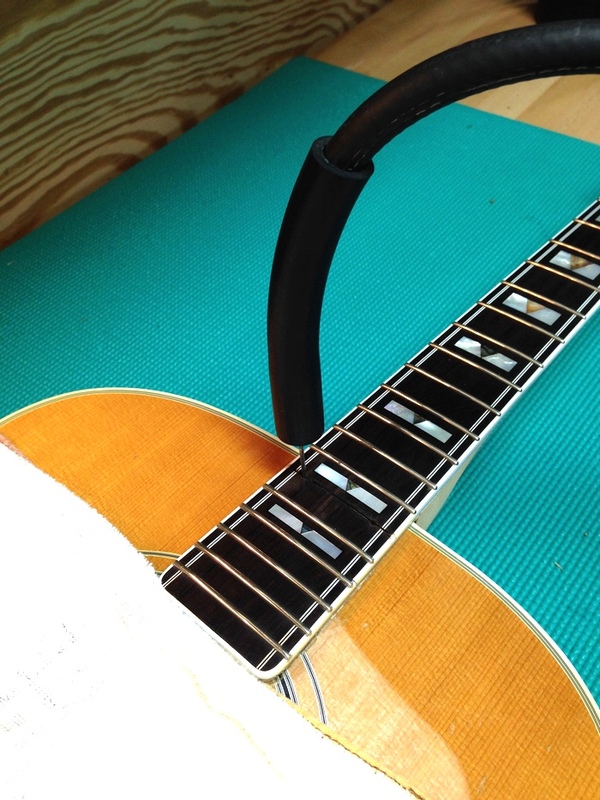 By the winter of 2014, my 1980 Guild F-412 12 string was in need of a neck reset. A straightedge, when placed on the fretboard, plowed down toward the top of the guitar contacting the bridge well below its top surface. Over the years the saddle had been lowered repeatedly and the bridge had been shaved (planed, to allow more saddle to be exposed) as the top had bellied and the neck had pulled forward. A JLD Bridge System had been applied internally and was marginally successful in adding a few more years of playability. The string height above the fretboard had grown too tall for my taste, and no more adjustments could be made to compensate for the problem. The time had come to put things right. In order to begin to correct the the string height issue, it would be necessary to slightly increase the angle of the neck back away from the top of the guitar. This adjustment also (ever-so-slightly) alters the distance from the nut to the saddle, also known as the scale length. Under optimal circumstances a new saddle might be shaped to compensate for the scale length variance. Equally often though, a new saddle slot needs to be routed at a new, precise location, requiring the existing slot to first be filled in. In my case, however, with both the scale length changing and the fact that the bridge is much thinner than desired due to shaving, the bridge needs to be replaced. This particular Guild was constructed with laminated Maple sides and arched back and a three-piece Maple-Walnut-Maple neck. 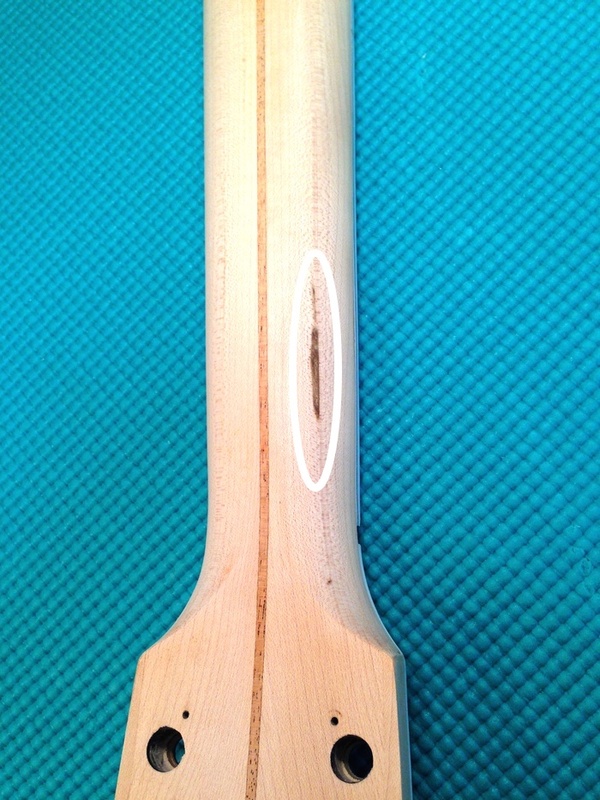 This cross-section view of the side (seen from the neck block dovetail mortise) reveals the two-ply lamination that makes up the sides. The guitar had been finished with a tinted nitrocellulose lacquer (NCL), referred to as Cabernet at the time, and top-coated with a clear lacquer. In 35 years, the clear finish had yellowed significantly (in my case as a result of aplenty of exposure to sunlight). I had always wondered just what the tinted finish was hiding and I determined that one day I would find out. Unlike the finish on my 1976 Guild F-50R which looked like a shattered windshield, this 1980 F-412 had suffered no finish checking, though it showed wear and tear, having a handful of nicks, dings and scratches. This was a Maple guitar and it had a dark, cabernet tinted finish. Was the finish hiding one or more flaws (as was often the case with these instruments)? I really wanted to see the original wood grain. Since I would be removing the neck in order to alter the neck angle, I decided that now was as good a time as any to tackle a re-finish. 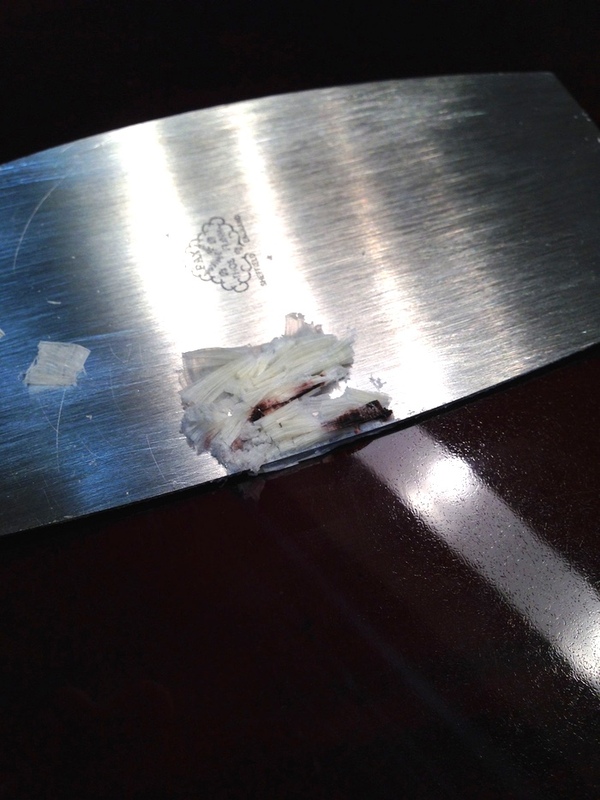 I would be using a sharpened scraper for removal of the nitrocellulose lacquer finish. 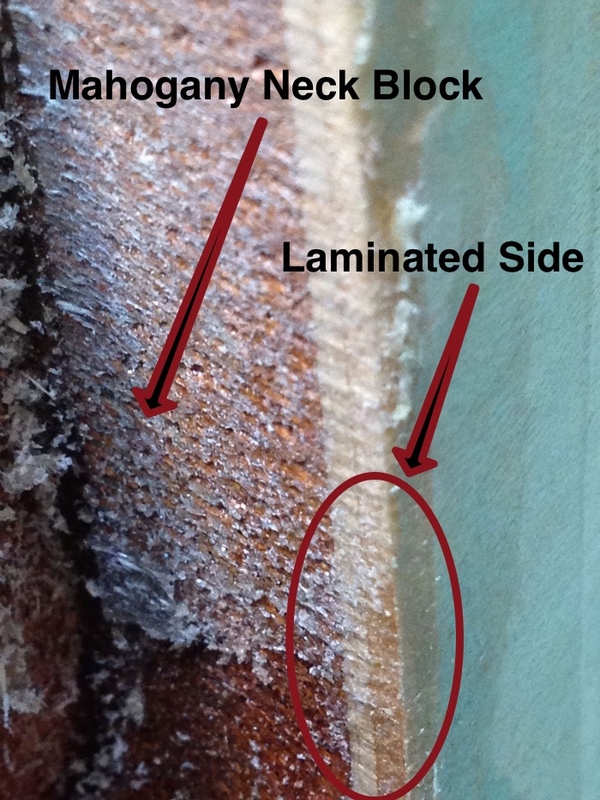 NCL dust can be toxic and messy, and easily clogs my non-loading sandpaper. Lacquer thinner is on my personal list of substances I never intend to knowingly breathe again, even with a respirator. It is impressively toxic, not to mention unbelievably flammable. In the unlikely even I were ever to reconsider my position on NCL, my shop is not set up to provide sufficient ventilation to give me peace of mind, so it won’t be happening any time soon. Lacquer thinner can readily soften glue joints and dissolve plastic binding. A scraper provides me very tactile feedback of my progress. Granted, it takes some elbow grease, but the results are consistently pleasing and achieved with minimal disturbance of the underlying wood. I laid the guitar face down on my bench, donned a mask, broke out my scraper, held my breath (figuratively speaking) and scraped up my first ultra-thin ribbons of lacquer. The top coat, as expected, was clear. 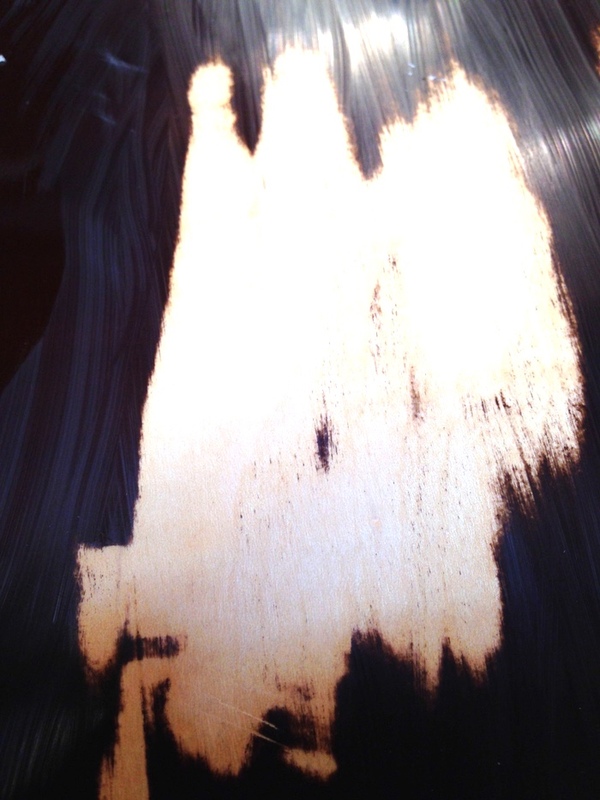 Subsequent scrapings revealed the darker, tinted lacquer that made up the initial darker coat(s). And then I hit pay dirt! The golden curly Maple that was barely visible beneath the finish and hadn’t breathed oxygen for three and a half decades suddenly leapt into view. 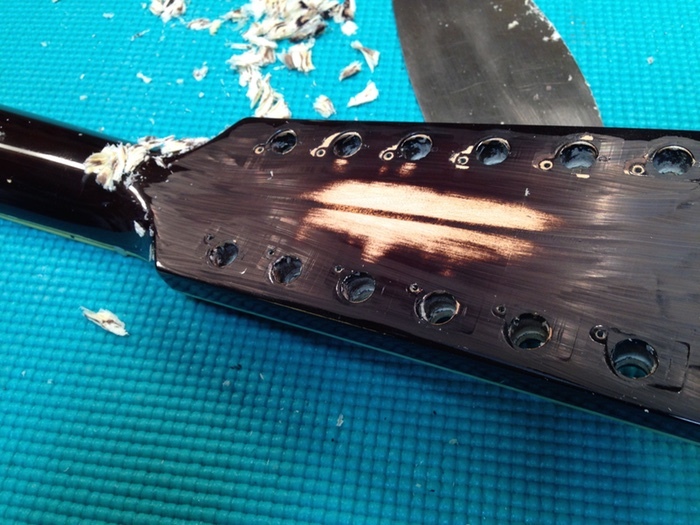 A view of the back of the headstock provides a hint at just how much scraping is necessary to peel away the finish. 2 hours later (and some serious neck, shoulder, arm, hand and finger work that left me begging for a massage) and I was left wondering why this Maple had been covered in the first place. While certainly not breathtaking, it looked just fine. I was relieved to not find any real flaws in the Maple on the body and delighted at the prospect of seeing a clear finish go back on this guitar. 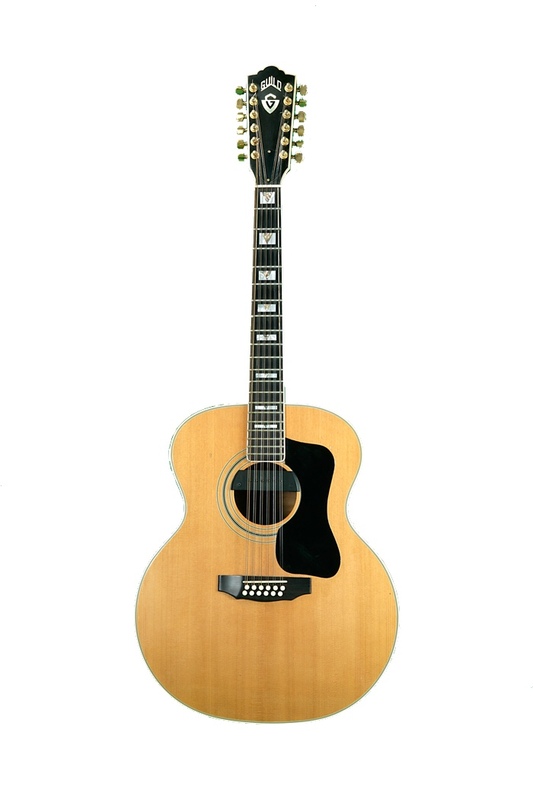 The thin finish of the neck scraped off readily, and revealed the only notable aesthetic ‘flaw’ on the entire guitar, a 2″ streak of discolored wood on the backside of the neck, near the headstock. This flaw is not a surface stain and the (already completed) dimensions of the neck will not be disturbed so it will remain ‘as is’ with no attempt made to hide it. I would venture to guess that this flaw alone may have contributed (if not driven) the decision to add this guitar to the list to be tinted. 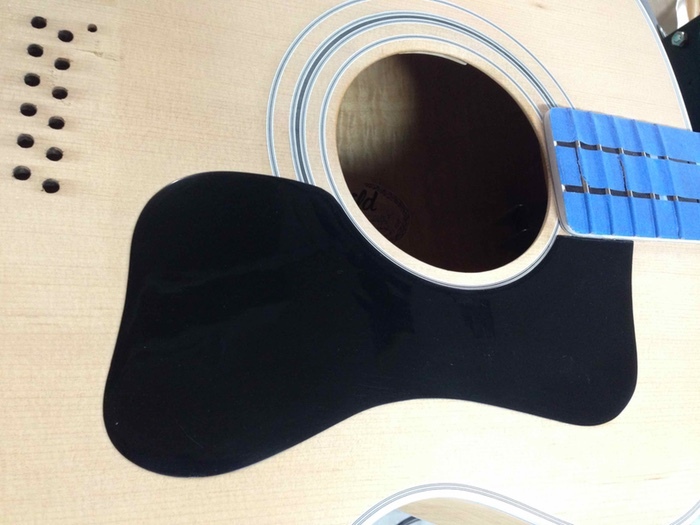 The ebony-colored fiberboard head plate with mother-of-pearl inlay scraped down perfectly smooth. It will look great, once re-finished. I removed and re-glued the binding around the headstock, something I had wanted to do for a long time. Satisfied with the results thus far, I set out to remove the neck. Using a soldering iron I heated the 15th fret (one fret wire closer to the soundhole than the point where the neck joins the body and carefully removed it with nippers. 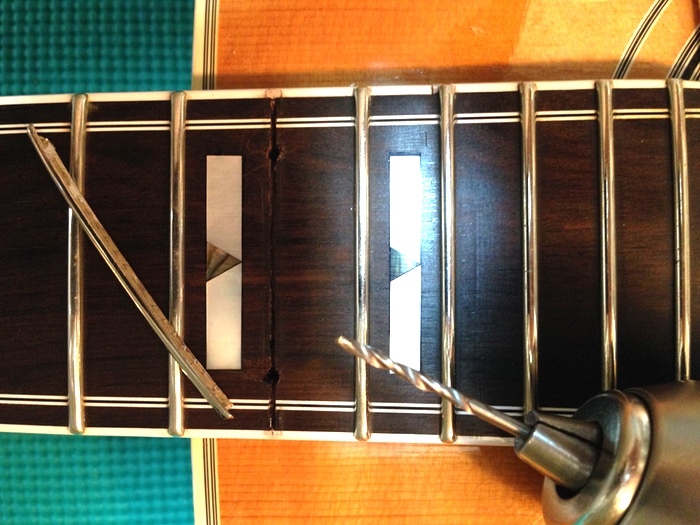 Heating the fret helps minimize chip out of the brittle ebony, as the barbed fret tang is forced up and out, against its design. The geometry of the neck joint is, essentially, a mortise and tenon, with the tenon being flared slightly to form a shallow dovetail shape which permits the tenon (or tail) of the neck to lightly wedge into the corresponding mortise, a tapered cavity cut out into the neck block. 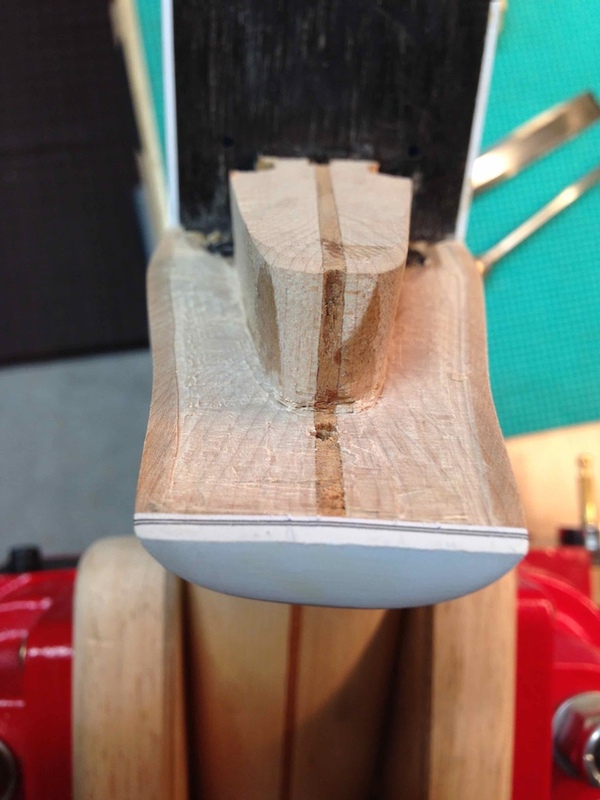 This wedged dovetail joint resists the pull of the strings just fine without any glue. Technically, the neck need only be kept from shifting up and out of it’s socket. Two methods are used to secure the neck, one being a tapered pin that runs horizontally across the block and through the tail. The most common method is to apply glue ONLY to the sides (shoulders) of the tenon, adhering the long grain of the tenon to the long grain of the mortise. This is sufficient to hold the neck in place. I drilled two holes inside the 15th fret slot (some folks claim success with only one hole - I prefer one on each side of the dovetail), through the fretboard, through the top and down into the glue cavity. Short of an x-ray of the guitar it is guesswork to determine the exact placement of the holes. Depending upon what lies beneath, if the holes are spaced too wide (or the angle is wrong), one can end up drilling into the solid wood of the neck block or the triangular tail of the neck. Neither is desirable, as the purpose of the holes is to create a path in order to introduce hot steam into the small open space of the glue joint, a very small area between the end of the tail and the neck block, in order to soften the glue that has been applied to the sides (shoulders) of the tail sufficiently to release the neck from the body. Something of an urban legend has developed over the decades regarding a notion that Guild dovetailed guitar necks are somehow generally more difficult to remove than other manufacturer’s dovetailed necks. This has simply not been my experience with these guitars, now spanning more than 4 decades, but could there be some truth to this claim? 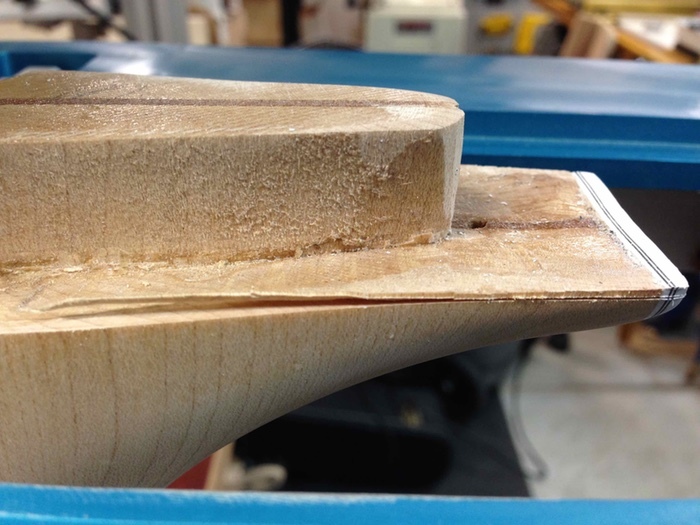 Guild neck heels have tended to be wider than Martin neck heels where they meet the body, having a wider dovetail and (potentially) resulting in more glueing surface area in the cavity between the end of the tail and the wall of the neck block. With some instruments, so the story goes, glue was applied so liberally that the excess glue squeeze-out filled that small cavity, entombing the dovetail in glue. It is important to note that there is only so much space available inside any of these joints for glue to fill. That said, if a particular guitar was put together with the maximum amount of glue that could possibly be applied, and there just happened to be some extra space inside that cavity, it could result in a little more effort being needed to remove the neck. Glue applied to end grain (such as the end of the dovetail) has very little bonding capability. When properly softened, it is just not that big of a deal to remove the neck. Short of general inexperience, I believe the primary reason for difficulty encountered during dovetail neck removal on Guild guitars may have more to do with improper placement of the steam hole(s) and/or insufficient application of steam/heat than the amount (or even type) of glue used. I attached a neck removal jig to the body. It’s purpose is to apply pressure to the heel of the neck at the end cap, to un-wedge the compound angle of the triangular tenon from its corresponding mortise. 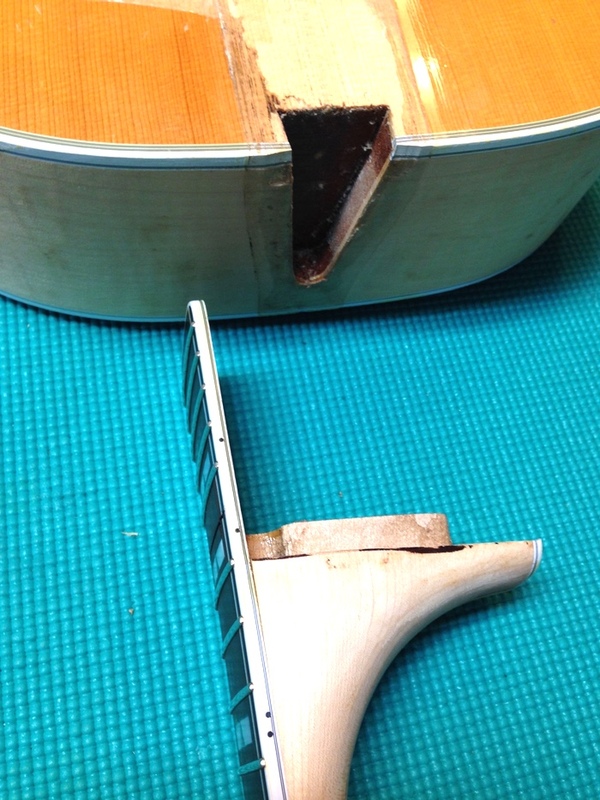 Depending on the guitar, it can be prudent to remove the end cap from the heel or leave it in place. I opted for the latter (and was glad I did once I saw how the neck had been prepared for it’s initial glue-up). Steam is introduced into the glue joint via a hollow metal tube attached to a hose which, in turn, is attached to a high-quality steam source (a cappuccino machine ;~}), through the two holes drilled in the fret slot. 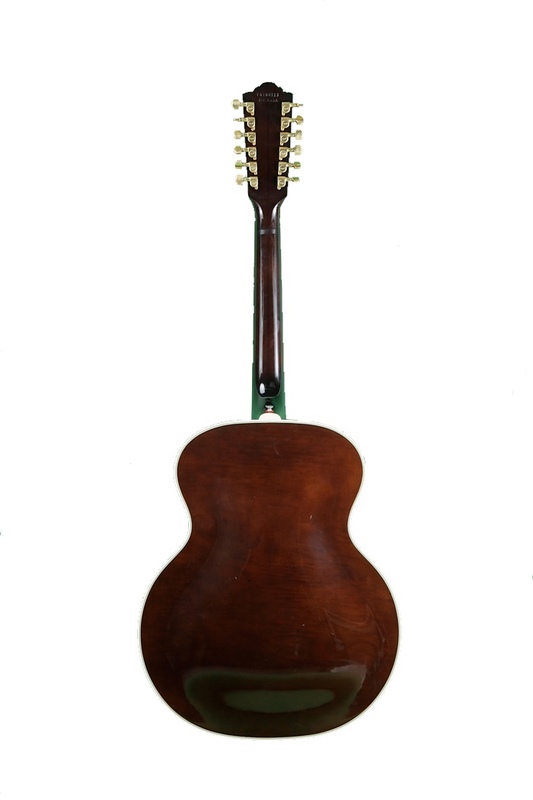 The guitar was propped up level to allow any water (cooled, condensed steam) to drain down and away from the instrument, as opposed to letting it run onto (or worse, into) the body of the guitar. Alternating the steam between holes while gently increasing pressure against the end cap was sufficient to break the neck loose. Time elapsed: Less than 5 minutes total with approximately 2 teaspoons of water on the bench. I towel dried all the parts and inspected the joint. Everything looked good. I spent another hour carefully scraping and sanding to remove any remnants of lacquer from the neck and body, and then moved on to the soundboard. I had left the finish in place during the application of steam, as it would offer a degree of protection should any water hit the top. I heated the ebony bridge (a heat gun, heat lamp, hot iron or even a hair dryer will work) to soften the glue. Care must be taken to not overheat the surrounding areas, as other glue joints (bridgeplate, braces, top to sides, binding, etc.) need to stay intact. 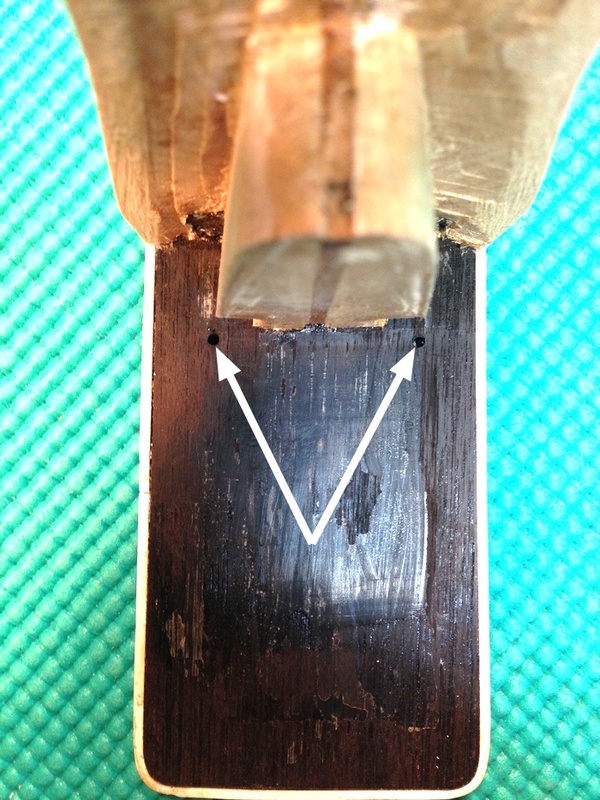 Some very thin tools were used to release the bridge from the underlying Spruce. Hardwood bridges are glued directly to unfinished, soft(er) wood tops. When removing a bridge it is important to work slowly and deliberately to minimize any tear out. The same process removed the pickguard, which resulted in some tear out, as the pickguard had been fused into raw, unfinished wood as opposed to being adhered to the finish. 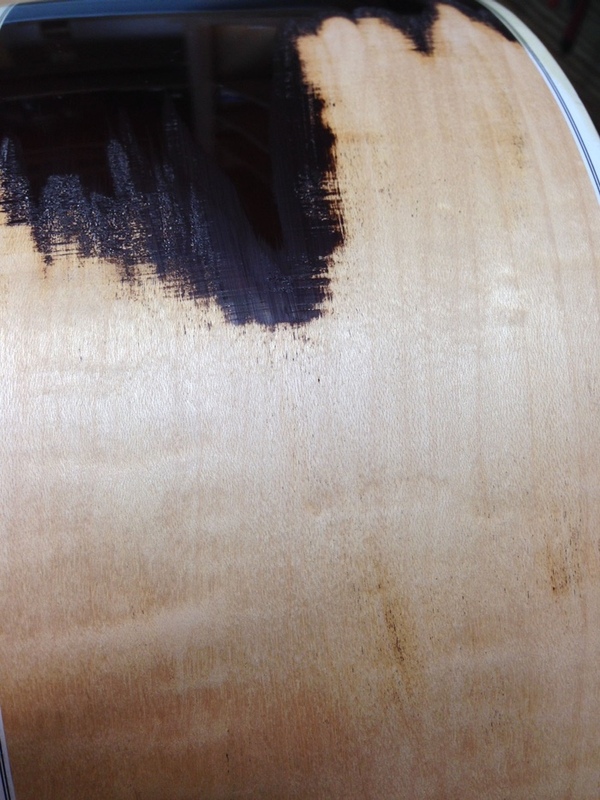 Interestingly, lifting the pickguard away from the top also revealed some serious grain runout in the Spruce. I will be replacing the pickguard, which will (thankfully) cover any blemishes. I spent a bit more time improving the condition of the white plastic binding which was (evidently) a bit irregular to begin with. There were a couple of cracks in the binding around the fingerboard but, as they were stable, I chose to leave them alone. Solvent-based plastics can shrink over time and, when they do, they can leave some nasty scars. With the fingerboard, bridge and pickguard removed from the body it was a simple task to carefully remove the finish from the Spruce top. It was important to just take off the finish, not the underlying wood, since a top’s thickness plays a major role in determining it’s sound. With that task accomplished, I wiped a coat of Shellac over the top to offer some protection as I continued to work with the guitar. Traditionally, these incredibly tough celluloid pickguards were fused into the underlying wood by using a solvent-based adhesive (since they are made of a solvent-based plastic), then a lacquer finish was sprayed over the top. Celluloid can shrink (breaking down over time), and if you saw how well glued to the Spruce this type of pickguard can be, it would be easy to understand why so many vintage soundboards have cracks or splits below the pickguard. The pickguard shrinks as the solvents flash off over the years, ripping and tearing the wood it is directly fused with away from the adjoining wood. Thankfully, that had not occurred to this 12 string. But to re-affix the celluloid pickguard I would need to apply a solvent-based adhesive and fuse the pickguard back into the wood. I opted to alter the appearance, altogether, and apply a Guild-shaped, quasi-tortoise looking pickguard over the top of the finish. My 12 string originally came with an ebony bridge, where some F-412’s of that time shipped with rosewood bridges. I decided to stay with the original look, with the headplate, fingerboard and bridge all being of the same wood, so I hand-planed a piece of ebony square, thickness sanded it, traced the old bridge, cut it on the bandsaw, sanded to the traced lines and shaped the wings. I will wait to produce the saddle slot until after the new bridge is glued in place, as I wish to alter the compensation that had been established for the guitar, originally. Using the top deflection measurement taken at the beginning along with the length of the neck heel and the distance from the nut to the center of the 14th fret, it was possible to calculate the amount of material I needed to remove from the base of the heel to angle the neck correctly. 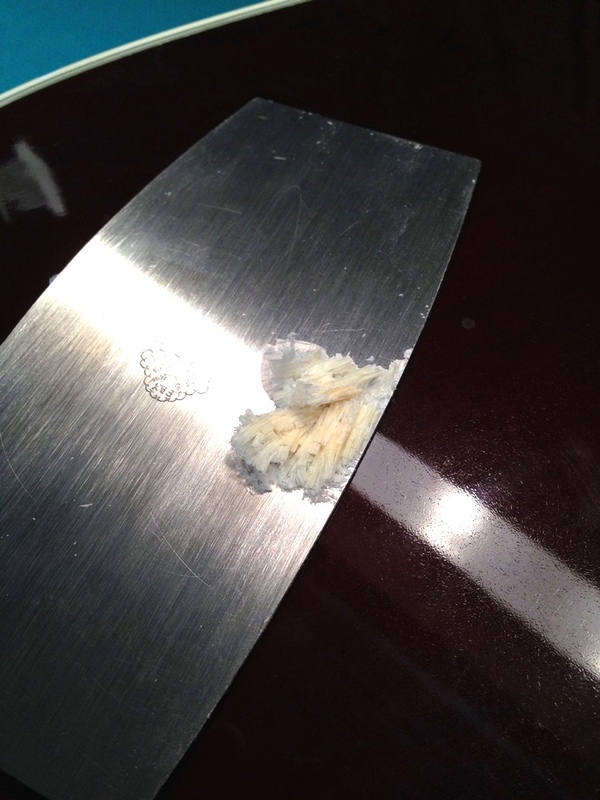 This Guild neck heel was thin to begin with, so great care had to be taken when removing even more material. The bridgeplate was in remarkably good condition (I can make a fairly decent argument for being careful with string changes - ;~}) and all bracing was intact so no internal repairs were necessary. I taped off the location of the bridge in order to have bare wood to re-attach the new bridge to, and then it was time to get started on the finish prep. 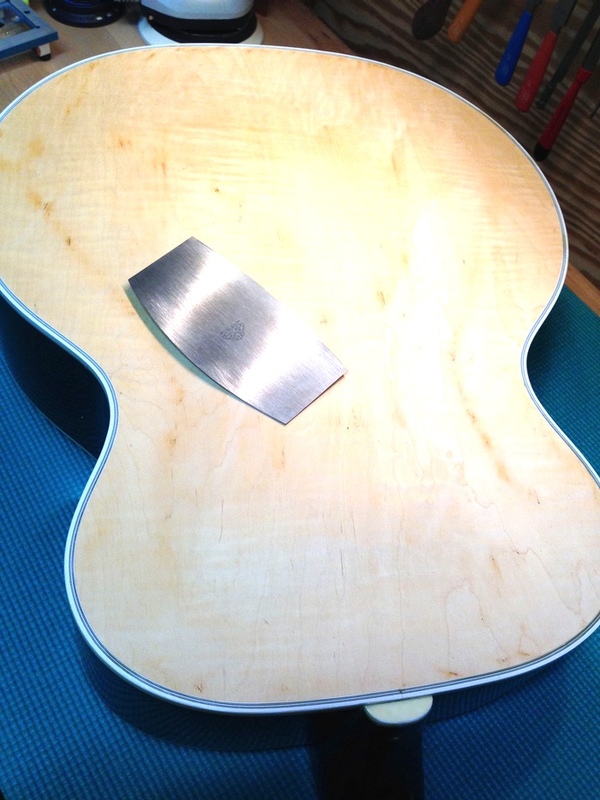 The neck and body were sanded to 320 grit for a perfectly smooth, scratch-free surface. It is important to not "scrub" the wood (especially a softwood top such as Spruce or Cedar), generating heat as though burnishing, as that seems to merely pack the dust into the surface. For a glossy finish on furniture that can be advantageous. For a musical instrument it can be detrimental. Wiping with naphtha is helpful to reveal any flaws, as well as to remove residual dust. Typically, a softwood such as Spruce (used on the top) requires a pore filler. I have opted to squeegee a thinned epoxy across the top, allow it to dry and sand flat, though a few coats of Shellac will usually also accomplish the goal. 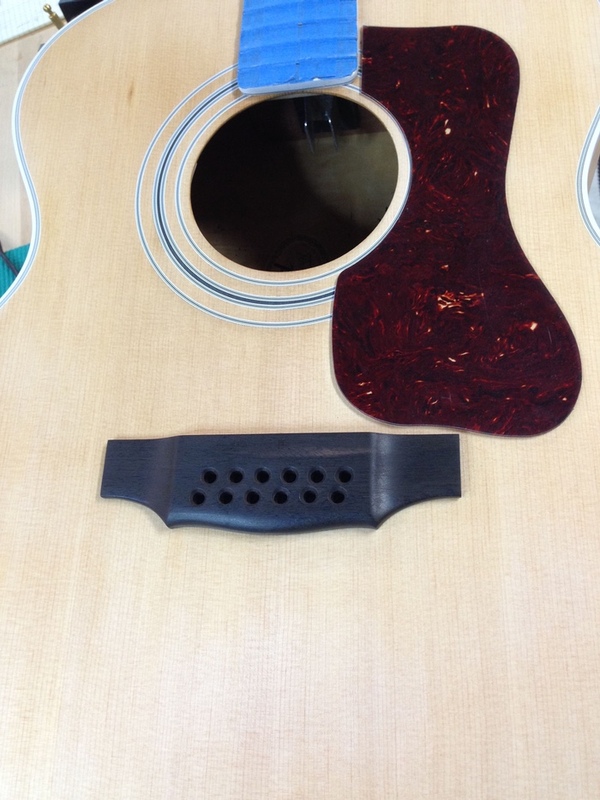 The back, sides and neck of this 12 string are Maple, making pore filling unnecessary. I had considered using a special Shellac on this 12 string, a formulation that adds cross-linking hardeners and a plasticizer, but I opted to go with a more durable waterborne Urethane. The new bridge was glued on using non-creeping hide glue, whose working time is measured in seconds rather than minutes. With that kind of time constraint it is imperative to have a dress rehearsal or practice run prior to applying any glue. The bridge is clamped in place, any squeeze out is wiped up immediately, and the bridge is left to dry. The new pickguard comes with an adhesive backing and is applied over the top of the finish. A new nut is fashioned for the headstock end of the fretboard. Using a clever tool, the precise compensated position of each string is transferred onto the bridge. This allows for precise positioning of the routed saddle slot. A new saddle is fashioned for the bridge, the machine heads are re-attached to the headstock, the guitar is strung and tuned to pitch, and the overhaul of this 1980 Guild F-412 is complete!